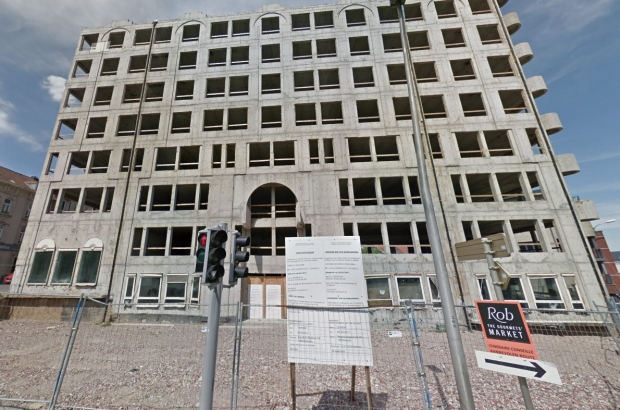 A seven-storey building undergoing renovation in Woluwe-Saint-Pierre had to be demolished urgently on Tuesday, as it appeared to be on the brink of collapse. The Avenue de Tervuren was closed to traffic on Tuesday afternoon for the emergency demolition. A security perimeter was set up around the Chien Vert building, at Avenue de Tervuren 300, and residents were ordered to leave their homes. "The unstable part of the building was destroyed as a matter of urgency," said Woluwe-Saint-Pierre mayor Benoît Cerexhe. "The operation went as planned. Now the rest of the building will be demolished." The road reopened around 22.00 on Tuesday evening and trams 39 and 44 are running normally again.